In mid 2010, stunt team Nitro Circus brought their live stunt show to Australia, and the Kymco UXV 500 4 x 4 side by side was the mount of choice for their crazy antics. Starting as an American television series, Nitro Circus features 14 time X-Games medalist Travis Pastrana, and his friends, travelling around the world riding dirtbikes, and performing death defying stunts. 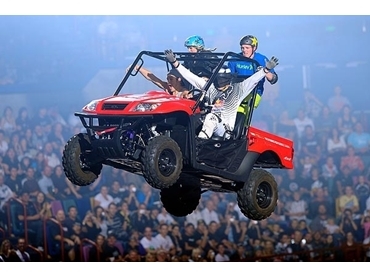 Nitro Circus purchased the Kymco UXV 500 4 x 4 vehicle for use in their show, with professional stuntmen carrying out extensive testing, all of which was successfully passed. The Nitro Circus team really tested the Kymco UXV's class leading suspension by jumping the 4 x 4 side by side over 10m in the air, a stunt that also proved Kymco’s superior engineering, reliability, and stability. The wear and tear the Nitro Circus team put on the Kymco UXV 4 x 4 side by side did not slow down the performance of the vehicle at all as it performed each night without any trouble. The Kymco UXV 500 4 x 4 side by side is designed as a high powered utility vehicle made for farm work with 36 horsepower and enough torque to complete the roughest of challenges. The electronically activated differential lock provides maximum traction for sticky situations. The Kymco UXV 500 was also used for stunt practice on the television show "Hey Hey It’s Saturday".